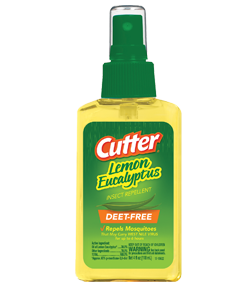 The active ingredient in Cutter® Lemon Eucalyptus Insect Repellent is derived from the leaves of the Lemon Eucalyptus tree. Repels mosquitoes, including those that may transmit the Zika, West Nile, Dengue and Chikungunya viruses. Repels mosquitoes for up to 6 hours. Not sticky or greasy. Cool Lemon Eucalyptus scent. Hold eye open and rinse slowly and gently with water for 15-20 minutes. Remove contact lenses, if present, after the first 5 minutes, then continue rinsing. Call a Poison Control Center or doctor for treatment advice. Call a Poison Control Center or doctor immediately for treatment advice. Have person sip a glass of water if able to swallow. Do not induce vomiting unless told to by a poison control center or doctor. Do not give anything by mouth to an unconscious person. Have the product container or label with you when calling a Poison Control Center or doctor, or going for treatment. In case of emergency call 1-800-767-9927.